r aspects of network structure have attracted attention as well. The field continues to develop at a brisk pace, and has brought together researchers from many areas including mathematics, physics, biology, computer science, sociology, epidemiology, and others. Ideas from network science have been applied to the analysis of metabolic and genetic regulatory networks, the design of robust and scalable communication networks both wired and wireless, the development of vaccination strategies for the control of disease, and a broad range of other practical issues. Research on networks has seen regular publication in some of the most visible scientific journals and vigorous funding in many countries, has been the topic of conferences in a variety of different fields, and has been the subject of numerous books both for the lay person and for the expert. 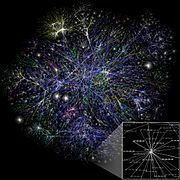 A network is named scale-free if its degree distribution, i.e., the probability that a node selected uniformly at random has a certain number of links (degree), follows a particular mathematical function called a power law. The power law implies that the degree distribution of these networks has no characteristic scale. In contrast, network with a single well-defined scale are somewhat similar to a lattice in that every node has (roughly) the same degree. Examples of networks with a single scale include the Erdos–Renyi (ER) random graph and hypercubes. In a network with a scale-free degree distribution, some vertices have a degree that is orders of magnitude larger than the average - these vertices are often called "hubs", although this is a bit misleading as there is no inherent threshold above which a node can be viewed as a hub. If there were such a threshold, the network would not be scale-free.